The NRM Regime have during the FY2015/2016 fallen behind on paying out UGX 2.7 trillion! Today I am dropping numbers that are devastating, as the numbers of debt that the National Resistance Movement (NRM) isn’t paying, show’s sufficient motives for malpractice when it comes to budgeting and the structure of payments. There are certainly not enough transparency and clear audit of the state reserves, as the State is misusing seriously amount of funds. The NRM Regime and their President should be ashamed by their record. Emmanuel Katongole is the Head Information Technology in the Ministry of Finance, Planning and Economic Development (MoFPED) in Uganda on the 12th April 2017, he dropped a document on their web-page that show’s the domestic arrears of the Republic of Uganda in the last Financial Year. If you wonder what Domestic Arrears means: “The amount by which a government has fallen behind in its payment of interest and principal on debt to lenders within its own country” (Encyclo.co.uk). So Katongole will literately show how bad the National Resistance Movement is on paying their bills and expenditure. All the sums of this report is in Ugandan Shillings (UGX). Like under the Office of the President and the Internal Security Organisation (ISO) who itself leaves arrears in the margin of 3.8bn shillings and 8bn shillings in other payable arrears. That one part of the budget and current audit of the Office of the President as the total of verified arrears at June 2016 was 37bn shillings alone. So the Office of the President owes a lot of funds that it hasn’t paid, not only for the ISO! The State House by the verified arrears at June 2016 was 1bn shillings. What is more unsettling is that the Pensions and Gratitude for Veterans are the sum of 183bn shillings, Survivors 315bn shillings, EXGRATIA 10bn and UNLA 26bn shillings. The Ministry of Defense by June 2016 verified arrears was 718bn shillings! So the MoD are a lax payer of their expenses and expenditure. Ministry of Justice and Constitutional Affairs owes verified arrears by June 2016 the amount of 684bn. Shillings Court Awards unpaid by the Ministry is 203bn shillings. The Electoral Commission has growing verified arrears by June 2016 because of Unsettled penal insterest for URA in the total sum of 3.2bn shillings. Uganda National Roads Authority (UNRA) has by June 2016 billed up verified arrears by 283bn shillings. This is just some of the government that has not paid their dues and their expenses, their salaries or pensions, even their lacking covering of funds to pay debt, either internal or external. So the National Resistance Movement are clearly running an economy and fiscal policy that isn’t healthy for the republic. Just to drop the total sum that the Government of Uganda has failed to pay or failed payments on their debt are by June 2016 the total of 2.7 Trillions of Uganda Shillings! Which is an insane number and amount of misspent monies by the state. The strategy by the Republic to fail so miserably cannot be sustainable, as the invoices and the target to pay their debt should be the most important. Still, the NRM doesn’t seem to think so. They are surely missing steps to having a sound economy when the verified arrears are hitting 2.7 trillions by June 2016. So the Financial Year of 2015/2016, the Ugandan government failed to serve out over 2 trillion of their needed expenses! What is troubling that the year before, the total state had not paid on their debt and failing expenses in the Financial Year of 2014/2015 as by June 2015 we’re totally 1.389 or close to 1.4 Trillion shillings. So the miss-match between FY2014/2015 and FY 2015/2016 are 1.3 Trillion shillings. So the clear picture is that the Election Year for the NRM is very, very expensive. Just think about that… eat the bill and pound on the amount of lost monies in the system. Peace. Draft estimate for the Financial Year of 2015/2016 and how it’s expected to be. It will be a bunch of numbers and I have picked the ones that seem special. The ones that could be questioned and ask yourself why they use so much money on? That tells about how much the government of Uganda planning to use on certain pieces of civil service and ministries that they run. Everybody that wants to look and understand a bigger picture will get a bit more information. But even if this feels like a long piece. Remember the document that was swallowed into this was close to 1200 pages. So that I have written a long piece it’s a reason why and how it became this long. Hope your get some insights and it was worth my time. The Salaries are the same from 2014/2015 to 2015/2016. No change the same 26,233,125 UGX. The rest of the expenditure is the same except for the secret payment between the financial years and that is the “Classified Expenditure” which goes up sustainably from 2014/2015 when it was 11,069,633 to the next 2015/2016 it becomes 18,069,633. So it means that the Office of the President has one expense that goes to something secret and is up 7,000,000 from last year and the only one(Draft Estimates P: 30). There has even been another classified expenditure that is set for 3,940,034 UGX and this is not for the main Office of the President, but to the specific program of “Monitoring and Evaluation” (Draft Estimates P: 35). Total for the Office of the President is 53,835,847 UGX (Draft Estimate P: 42). Another “Classified Expenditure” is set for the FY 2015/2016: 36,700,000 UGX (Draft Estimates P: 44). The Total for the Statehouse is 253, 226,426 UGX (Draft Estimate P: 43). Total budget for the Office of the Prime Minister is set to be for the FY 2015/2015: 146,581,639 UGX (Draft Estimate P: 82). “Construction of Pakwach, Kabale, Morulem, Napak Police stations completed; Construction of a staff accommodation block of 4 units at Alebtong completed; Armouries constructed at Ikaffe, Kabalye and Olilim PTS; 10 vehicles procured for PRDP districts; ICT machinery and equipment (communication equipment) procured; Office furniture for Buliisa, Aleptong, Bukwo and Yumbe procured)” (Draft Estimates P: 25). The estimated budget for the UPF is 4bn for the FY 2015/2016. Gen. Kale Kayihura Salary is from next year 103,200,000 UGX (Draft Estimates P: 24). Grand total for the UPF in FY 2015/2016 is 435.133.848 UGX (Draft Estimate 839). A budget issue that is weird that the ESO in the voting didn’t put any funds for staff training for FY 2015/2016 (Draft Estimate P: 917). Grand total for FY 2015/2016 is 18.359.204 UGX (Draft Estimate P: 914). Prison and Correctional Services in the FY 2015/2016 is 136.960.199 UGX (Draft Estimate 840). Murchison Bay Hospital in the FY 2015/2016 is 418.750 UGX (Draft Estimate P: 844). Grand total for the Uganda Prisons in the FY 2015/2016 is 136.960.199 UGX (Draft Estimate P: 848). Total Vote for the ministry: 1,460,211,641 UGX (Draft Estimate P: 84). The ones that caught my eyes was first Welfare and Entertainment went from last Budget Year 2014/2015: 27,190,131 and this year 2015/2016: 37,614,465 UGX. Special Meals and Drinks a new post in the ministry and costs: 94,645,610 UGX. Subscriptions we’re 2,699,752 UGX in 2014/2015 and next year 2015/2016 cost 12,099,752 UGX – for those who can see that is nearly up 10,000,000 in one budget year! My favorite post in any ministry: ‘Classified Expenditure’ in 2014/2015 costed 342,252,085 and next budget year 2015/2016 all of a sudden 606,304,585. The difference between the budget years is 264,052,500 UGX. The Classified Expenditure is spilt in two pieces. First one is the UPDF Support and is set for 258,578,085 (Draft Estimate P: 86). The second one is Defense Equipment Project is 342,352,500 UGX (Draft Estimate P: 87). AMISOM operation total is 269,784,415 UGX. Classified Expenditure for AMISOM is 5,374,000 UGX (Draft Estimate P: 88). External Project Financing: Defense Equipment from Russia is estimated for FY 2015/2016: 264,052,500 UGX and to AMISOM is 298.266.10 UGX (Draft Estimate P: 81). Total budget for is set to 21,908,949 UGX (Draft Estimate P: 103). Total budget is set to 26,605,155 UGX (Draft Estimate P: 117). Grand total to the EAC in FY 2015/2016 is set to 24.407.661 UGX (Draft Estimate P: 505). Grand total for FY 2015/2016 is 16.144.072 UGX (Draft Estimate P: 1024). Grand total in FY 2015/2016 is 4.711.810 UGX (Draft Estimate P: 1028). Grand total in FY 2015/2016 is 4.948.238 UGX (Draft Estimate P: 1032). Grand total in FY 2015/2016 is 3.455.643 UGX (Draft Estimate P: 1036). Grand total in FY 2015/2016 is 1.998.634 UGX (Draft Estimate P: 1040). Grand total in FY 2015/2016 is 4.259.503 UGX (Draft Estimate P: 1044). Grand total in FY 2015/2016 is 2.742.654 UGX (Draft Estimate P: 1048). Grand total in FY 2015/2016 is 1.589.496 UGX (Draft Estimate P: 1052). Grand total in FY 2015/2016 is 2.732.934 UGX (Draft Estimate P: 1055). Grand total in FY 2015/2016 is 5.853.886 UGX (Draft Estimate P: 1059). Grand total in FY 2015/2016 is 2.346.789 UGX (Draft Estimate P: 1063). Grand total in FY 2015/2016 is 3.673.069 UGX (Draft Estimate P: 1067). Grand total in FY 2015/2016 is 2.112.602 UGX (Draft Estimate P: 1071). Grand total in FY 2015/2016 is 5.362.895 UGX (Draft Estimate P: 1075). Grand total in FY 2015/2016 is 3.983.632 UGX (Draft Estimate P: 1079). Grand total in FY 2015/2016 is 1.899.252 UGX (Draft Estimate P: 1083). Grand total in FY 2015/2016 is 1.999.326 UGX (Draft Estimate P 1086). Grand total in FY 2015/2016 is 3.487.953 UGX (Draft Estimate P: 1090). Grand total in FY 2015/2016 is 4.834.260 UGX (Draft Estimate P: 1094). Grand total in FY 2015/2016 is 4.248.162 UGX (Draft Estimate P: 1098). Grand total in FY 2015/2016 is 3.309.956 UGX (Draft Estimate P: 1102). Grand total in FY 2015/2016 is 2.264.481 UGX (Draft Estimate P: 1106). Grand total in FY 2015/2016 is 4.786.408 UGX (Draft Estimate P: 1110). Grand total in FY 2015/2016 is 3.775.725 UGX (Draft Estimate P: 1114). Grand total in FY 2015/2016 is 2.220.432 UGX (Draft Estimate P: 1118). Grand total in FY 2015/2016 is 2.366.211 UGX (Draft Estimate P: 1122). Grand total in FY 2015/2016 is 3.060.051 UGX (Draft Estimate P: 126). Grand total in FY 2015/2016 is 3.410.337 UGX (Draft Estimate P: 1130). Grand total in FY 2015/2016 is 2.407.393 UGX (Draft Estimate P: 1134). Grand total in FY 2015/2016 is 2.019.694 UGX (Draft Estimate P: 1138). Grand total in FY 2015/2016 is 5.135.304 UGX (Draft Estimate P: 1142). Grand total in FY 2015/2016 is 2.770.166 UGX (Draft Estimate P: 1146). Grand total in FY 2015/2016 is 2.770.881 UGX (Draft Estimate P: 1150). Grand total in FY 2015/2016 is 1.709.952 UGX (Draft Estimate P: 1154). Grand total in FY 2015/2016 is 821.446 UGX (Draft Estimate P: 1158). First is the difference in ‘Legislation and Legal service’ between last year’s FY 2014/2015 2.934.969 UGX and this FY 2015/2016 is 6.519.956 UGX (Draft Estimate P: 118). Total to the Ministry is 57.324.370 UGX (Draft Estimate P: 133). Macroeconomic Policy and Management was had budget for FY 2014/2015: 14.860.620 UGX and become 22.596.043 UGX in the FY 2015/2016 (Draft Estimate P: 135). Capitalisation of Institutions cost in FY 2014/2015 the amount of 65.802.344 UGX and in FY 2015/2016 becoming 266.602.344 UGX. The Belgo-Ugandan Study went from 3.167.890 UGX in FY 2014/2015 and comes to 10.237.890 UGX in FY 2015/2016. Development Budget where the Capitalisation and Belgo Uganda Study is a part of went from 86.650.930 UGX in FY 2014/2015 to 303.365.890 UGX in FY 2015/2016. Presidential Initiatives to Banana Industry was in FY 2014/2015: 2.974.000 UGX and in FY 2015/2016 is now 6.530.000 UGX (Draft Estimate P: 135). Financial Inclusion in Rural Areas (Profira) went from 1.542.229 UGX in FY 2014/2015 to 15.251.632 UGX in FY 2015/2016 (Draft Estimate P: 136). Contribution to Autonomous Institutions from 53.986.033 UGX in FY 2014/2015 to the next year FY 2015/2016 it becomes 278..719.671 UGX (Draft Estimate P: 135). This funds that goes to Contribution to Autonomous Institutions is going to certain institutions in FY 2015/2016. 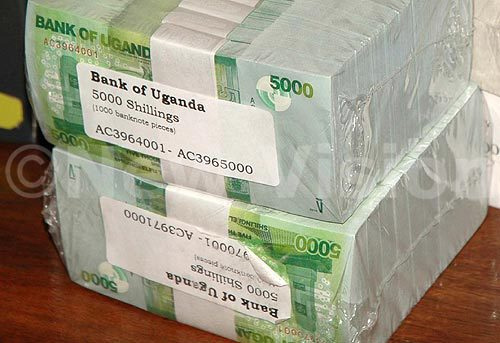 Here is how it’s shared: Uganda Development Bank: 10.000.000, African Development Bank: 4.000.000 UGX, PTA Banks: 4.800.000 UGX, Post Bank: 14.302.344 UGX, Islamic Development Bank 2.000.000 UGX, UN-DCF Symposium: 1.500.000 UGX and Re-Capitalization of BOU: 200.000.000 UGX (Draft Estimate P: 142). Capital Punishment was budgeted FY 2014/2015 to 2.974.000 UGX and in FY 2015/2016 is set to become 6.530.000 UGX this is because Other Structures will cost 4.000.000 UGX and didn’t spend on that last budget year (Draft Estimate P: 158). Uganda Free Zones or Total Program 18 was set to 14.009.556 UGX in FY 2014/2015 to become 17.177.409 UGX in FY 2015/2016 (Draft Estimate P: 159). African Development Fund was there 3.600.110 UGX into subscription in FY 2014/2015. And Outputs funded in FY 2015/2016 is the same 3.600.110 UGX (Draft Estimate P: 160). That same Output was set in FY 2014/2015, but nothing set for the FY 2015/2016, still it’ s put the same amount as last year with the same amount of cost. That doesn’t make sense. The Grand total the MoFPED in FY 2014/2015 was 281.508.520 UGX and in the new FY 2015/2016 becoming 551.167.383 UGX (Draft Estimate P: 168). Support of the Government Chemist was in FY 2014/2015 was set for 1.301.805 UGX and now in FY 2015/2016 became 3.331.805 UGX. It went up because this year Machinery and Equipment for 1.058.000 UGX compared to last FY (Draft Estimate P: 176). Agriculture Supplies from the FY 2014/2015 budget for 7.981.942 UGX and for the FY 2015/2016 set to be 43.285.943 UGX (Draft Estimate P: 184). Transport equipment FY 2014/2015 set 2.400.000 UGX and in next year FY 2015/2016 is set to 4.166.500 UGX. Engineering and design studies & Plans for Capital in FY 2015/2016 set for 4.841.848 UGX. Northern Uganda Farmers Livelihood Improvement Project FY 2015/2016 set for 2.121.842 UGX. Farm-Based Bee Reserves Establishment Project started in the FY 2015/2016 to be 300.000 UGX. The Goat Export Project in Sembule District FY 2015/2016 set for 1.200.000 UGX. Livestock Diseases Control Project Phase 2 FY 2015/2016 set to be 7.855.600 UGX (Draft Estimate P: 203-205). Sustainable Fisheries Development Project FY 2015/2016 set to be 1.341.000 UGX (Draft Estimate P: 206). Water for Agriculture Production FY 2015/2016 is 2.588.320 UGX (Draft Estimate P: 209). MAAIF Coordination/U Growth FY 2014/2015 was set 2.417.000 UGX in FY 2015/2016 set to be 27.217.803 UGX (Draft Estimate P: 214). The Project on Irrigation Scheme Development in Central and Eastern Uganda (PISD)-JI in FY 2015/2016 is set to 5.319.848 UGX. National Farmers Leadership Center (NFLC) FY 2015/2016 is set to 800.000 UGX (Draft Estimate P: 215). Total budget for the Ministry of Agriculture was in the FY 2014/2015: 84.075.417 UGX and FY 2015/2016: 142.530.281 UGX (Draft Estimate P: 217). Grand total for FY 2015/2016 is 9.147.189 UGX (Draft Estimate P: 871). NARO Internal Audit budgeted for FY 2015/2016 is 82.500 UGX. National Coffee Research Institute for FY 2015/2016 is 219.156 UGX (Draft Estimate P: 796). National Crops Research gets for FY 2015/2016 is 670.049 UGX (Draft Estimate P: 800). National Fisheries Research gets for FY 2015/2016 is 589.512 UGX. National Forestry Research gets for FY 2015/2016 is 439.458 UGX (Draft Estimate P: 801). National Livestock Research gets for FY 2015/2016 is 311.856 UGX (Draft Estimate P: 802). National Coffee Research Institute gets for FY 2015/2016 is 219.156 UGX (Draft Estimate P: 813). Grand total for NARO for FY 2015/2016 is 98.983.410 UGX (Draft Estimate P: 817). Grand total for FY 2015/2016 is 4.450.000 UGX (Draft Estimate P: 706). Grand total for FY 2015/2016 is 5.044.202 UGX (Draft Estimate P: 650). Workshops and Seminars for FY 2014/2015 is 988.640 UGX (Draft Estimate P: 920). Medical and Agricultural supplies for FY 2014/2015 is 28.352.628 UGX (Draft Estimate P: 921). Grand total for FY 2014/2015 is 43.792.300 UGX (Draft Estimate P: 919). Cotton Production Improvement for FY 2015/2016 is 3.911.000 UGX. Grand total for FY 2015/2016 is 7.786.481 UGX (Draft Estimate P: 897). District Administration and Development FY 2014/2015 the GoU is 8.857.525 UGX and External Finance 186.249.482 UGX totally for the FY 2014/2015 was 195.107.007 UGX. On the FY 2015/2016 GoU is 8.275.525 UGX and External Finance 80.987.122 UGX. Totally FY 2015/2016 is now 89.262.647 UGX. The External Finance from last budget year went down totally of 96.986.835 UGX. Which is significant And the total budget cuts is 105.844.360 UGX (Draft Estimate P: 219). Easy see that the External Finance is the reason why the cuts have happen. Markets and Agriculture Trade Improvement Project is FY 2014/2015 was 31.949.871 UGX. Had External Finance 29.879.482 UGX and GoU 2.070.389 UGX. The next FY 2015/2016 put the GoU funding 1.000.000 UGX and External Finance 2.757.122 UGX and the total budget FY 2015/2016 was set 3.757.122 UGX. Total budget difference from FY 2014/2015 to FY 2015/2016 is 28.192.749 UGX (Draft Estimate P: 224). Markets and Agricultural Trade Improvements Programme (MATIP 2) for the FY 2014/2015 was given from GoU 8.857.525 UGX + External Finance 186.249.482 UGX. Total for last budget year 195.107.007 UGX. FY 2015/2016 from GoU is 8.275.525 + External Finance 80.987.12. Total is 89.262.647 UGX (Draft Estimate P: 225). Difference between FY 2014/2015 versus 2015/2016 is 105.844.360 UGX in cuts and it’s because of less External Finances from the year before. FY 2014/2015 the GoU 32.091482 UGX + External Finance 191.619.482 the total for the year is 223.710.964 UGX (Draft Estimate P: 232). FY 2015/2016 the GoU 31.135.358 UGX + Eternal Finance 84.91712 the total for the year is 116.052.449 UGX (Draft Estimate P: 232). Grand total for FY 2015/2016 is 5.083.375 UGX (Draft Estimate P: 854). Albertine Region Sustainable Development Project for the FY 2015/2016 set for 6.767.783 which is external finance (Draft Estimate P: 234). Competitiveness and Enterprise Development Project [CEDP] last FY 2014/2015 totally GoU funding which was 8.884.098 UGX. In FY 2015/2016 the GoU where 8.814.098 UGX with the Eternal Finance was set to 10.280.000 which is totally of 19.094.098 UGX, the difference between the years is the 10.000.000 in External Finance (Draft Estimate P: 241). Capital Purchases from the Ministry for infrastructure projects is set for 6.767.783 UGX (Draft Estimate P: 246). Total budget for the ministry was FY 2014/2015 set for 30.214.981 UGX and for FY 2015/2016 is now 41.950.419 UGX (Draft Estimate P: 253). Uganda Teacher and School Effectiveness Project for FY 2014/2015 were given 8.061.000 UGX and FY 2015/2016 is set 90.395.134 UGX. And the External Finance for the project in the FY 2015/2016 is 88.355.134 UGX and was in FY 8.061.000 (Draft Estimate P: 255). So there is big difference between the budget years. Emergency Construction of Primary Schools Phase II FY 2015/2016 set for 1.864.900 UGX. Albertine Region Sustainable Development Project was in the budget for FY 2014/2015 we’re 650.000 UGX and in FY 2015/2016 become 12.187.015 UGX. Skills Development Project for FY 2015/2016 is 19.930.030 UGX. Development of PTCs Phase II comes in the FY 2015/2016 is 5.377.824 UGX. Akii Bua Olympic Stadium get in the FY 2015/2016 is 1.000.000 UGX. National High Altitude Training Centre (NHATC) get in the FY 2015/2016 is 5.829.800 UGX (Draft Estimate P: 256). Total budget for the Ministry was FY 2014/2015 set for 415.057.518 UGX and for FY 2015/2016 is now 400.556.219 UGX (Draft Estimate P: 283). Grand total for FY 2015/2016 is 5.789.344 UGX (Draft Estimate P: 741). Grand total for FY 2015/2016 is 21.337.135 UGX (Draft Estimate P: 583). Grand Total for FY 2015/306 is set 10.148.045 UGX (Draft Estimate P: 715). Project 1250 Support to Innovation – EV Car Project for FY 2015/2016 is 8.220.610 UGX (Draft Estimate P: 762). Project 1343 SPEDA II cost in FY 2015/2016 is 1.058.000 UGX. Grand Total for FY 2014/2015 is 201.606.596 UGX (Draft Estimate P: 765). Grand Total for FY 2015/2016 is 49.652.302 UGX (Draft Estimate P: 777). Grand total for FY 2015/2016 is 49.652.302 UGX (Draft Estimate P: 774). Grand total for FY 2015/2016 is 73.828.998 UGX (Draft Estimate P: 783). Grand total for FY 2015/2016 is 26.718.718 UGX (Draft Estimate P: 864). A part of ‘Clinical and Public Health’ has located to the Shared National Services get 6.930.000 UGX for FY 2015/2016 (Draft Estimate P: 285). Total to the Ministry is was FY 2014/2015 set for 581.740.966 UGX and for FY 2015/2016 is now 521.632.572 UGX (Draft Estimate P: 304). External Project Financing for the ministry was for FY 2015/2016 is 444.021.970 UGX (Draft Estimate P: 305). Management – Incapacity, death benefits and funeral expence: For FY 2015/2016 is 600.00. Staff training for the FY 2015/2016 is 486.656 UGX (Draft Estimate P: 926). Grand total for FY 2015/2016 is 53.809.703 (Draft Estimate P: 924). Grand total for FY 2015/2016 is 9.702.815 UGX (Draft Estimate P: 929). Grand total for FY 2015/2016 is 5.167.001 UGX (Draft Estimate P: 935). Grand total for FY 2015/2016 is 5.787.777 UGX (Draft Estimate P: 942). Grand total for FY 2015/2016 is 6.095.645 UGX (Draft Estimate P: 949). Grand total for FY 2015/2016 is 4.906.560 UGX (Draft Estimate P: 955). Grand total for FY 2015/2016 is 5.995.690 UGX (Draft Estimate P: 962). Grand total for FY 2015/2016 is 4.477.995 UGX (Draft Estimate P: 969). Grand total for FY 2015/2016 is 5.359.433 UGX (Draft Estimate P: 976). Grand total for FY 2015/2016 is 6.723.347 UGX (Draft Estimate P: 982). Grand total for FY 2015/2016 is 4.869.977 UGX (Draft Estimate P: 988). Grand total for FY 2015/2016 is 4.344.172 UGX (Draft Estimate P: 996). Grand total for FY 2015/2016 is 6.779.132 UGX (Draft Estimate P: 1002). Grand total for FY 2015/2016 is 4.756.488 UGX (Draft Estimate P: 1008). Grand total for FY 2015/2016 is 3.214.118 UGX (Draft Estimate P: 1013). Grand total for FY 2015/2016 is 5.800.972 UGX (Draft Estimate P: 1019). Safe Blood Provision for FY 2015/2016 is 2.517.065 UGX (Draft Estimate P: 878). Regional Blood Banks for FY 2015/2016 is 5.432.786 UGX (Draft Estimate P: 879). Grand total for FY 2015/2016 is 8.414.084 UGX (Draft Estimate P: 876). Grand total for FY 2015/2016 is 7.747.968 UGX (Draft Estimate P: 563). Grand total for FY 2015/2016 is 17.040.925 UGX (Draft Estimate P: 614). External funding from ADB to UCI which is 3.329.460 (Draft Estimate P: 620). Grand total FY 2015/2016 is 14.282.367 UGX (Draft Estimate P: 621). Grand total FY 2015/2016 is 218.614.467 UGX (Draft Estimate P: 626). Grand total for FY 2015/2016 is 4.169.557 UGX (Draft Estimate P: 753). Soroti Fruit Factory in the FY 2014/2015 was 4.846.906 UGX and in FY 2015/2016 set to10.482.787 UGX (Draft Estimate P: 306). Grand Total for the Ministry in FY 2014/2015 was 19.450.781 UGX and in FY 2015/2016 set to 25.594.837 UGX (Draft Estimate P: 322). Grand total for FY 2015/2016 is 15.697.657 UGX (Draft Estimate P: 902). Entebbe Airport Rehabilitation Phase 1 FY 2015/2016 is 252.875.768 UGX (Draft Estimate P: 324). Earth Moving Equipment Japan for FY 2015/2016 is set for 479.281.115 UGX, the GoU has 69.999.740 UGX the rest was 409.281.375 UGX (Draft Estimate P: 325). Transfers to other govt. Units (Capital) – FY 2015/2016 is 261.745.768 UGX, GoU are 8.870.000 UGX and the rest External Finance 252.875.768 UGX. Investmnt (Captial Purchase) – Machinery and equipment: FY 2015/2016 is set for 483.631.055 UGX. GoU is 73.349.680 and External Financing is 409.281.375 UGX (Draft Estimate P: 327). East African Trade and Transportation Facilitation – Construction/Rehabilitation of Railway Infrastructure – Other Structures: FY 2014/2015 we’re 7.000.000 UGX and in FY 2015/2016 is 450.000 UGX (Draft Estimate P: 333). New Ferry to replace Kabalega – Opening South both years FY 2014/2015 and FY 2015/2016 totally for both years 2.000.000 UGX (Draft Estimate P: 334). New Standard Gauge Railway Line the budget for FY 2014/2015 was 5.620.000 UGX and in FY 2015/2016 it’s now 3.500.000 UGX (Draft Estimate P: 335). Capacity Enhancement of KCCA in Management of Traffic in the FY 2015/2016 is 1.970.000 UGX. Entebbe Airport Rehabilitation Phase 1 in the FY 2015/2016 is 252.875.768 UGX (Draft Estimate P: 336). Master Plan on Logistics in Northern Economic Corridor in the FY 2015/2016 is 3.290.000 UGX. Gulu Municipal Council Roads (Preparatory Survey) in the FY 2015/2016 is 1.090.000 UGX (Draft Estimate P: 337). Redevelopment of State House at Entebbe in the FY 2015/2016 is 1.500.000 UGX (Draft Estimate P: 342). The ministry grand total was FY 2014/2015 is 122.364.181 UGX and in FY 2015/2016 is 837.629.393 UGX (Draft Estimate P: 357). Construction of RD Agency HQs budgeted to 10.000.000 UGX is FY 2015/2016. Design Kyenjojo-Hoima-Masindi-Kigumba (238km) was budget in FY 2014/2015 was 65.000.000 UGX and it was FY 2015/2016 is 104.400.000 UGX. Kampala Entebbe Express Highway was set for FY 2014/2015 was 130.000.000 UGX to FY 2015/2016 is 233.140.000 UGX. Kampala Flyover for FY 2015/2016 is 19.630.000 UGX. Construction of 66 Selected Bridges for FY 2015/2016 is 10.871.944 UGX. Upgrading of Muyembe-Nakapiripirit (92 km) for FY 2015/2016 is 22.600.000 UGX. Total Development Budget for the UNRA is for FY 2015/2016 is 1.725.000.114 UGX (Draft Estimate P: 595). Grand total for FY 2015/2016 is 1.761.658.654 UGX (Draft Estimate P: 611). Design for the New Nile Bridge at Jinja is supported from Japan. Design Kyenjojo-Hoima-Masindi-Kigumba (238km), Upgrading Rukungiri-Kihihi-Ishasha/Kanungu Road and Upgrading Mbale-Bubulo-Lwakhakha Road is financed from the African Development Bank. Kampala Flyover is supported from Japan (Draft Estimate P: 613). Grand total for FY 2015/2016 is 428.101.919 UGX (Draft Estimate P: 634). Kampala-Entebbe Expansion Project was in FY 2014/2015 is 4.920.000 UGX and in FY 2015/2016 is 53.493.000 UGX. Large Hydro power infrastructure FY 2015/2016 is 2.314.840.000 UGX. The Hydro power projects are: Isimba HPP, Karuma Hydroelectricity Power Project, Muzizi Hydro Power Project and Nyagak III Hydro Power Project (Draft Estimate P: 359). Strengthening the Development and Production Phases of Oil and Gas Sector is set for budget FY 2015/2016 are 63.145.000 UGX (Draft Estimate P: 402). Isimba HPP and Karuma Hydroelectricity Power Project is Financed from China. The Kampala-Entebbe Expansion Project is financed Germany Federation Republic. The Muzizi Hydro Power Project was financed from France. Development and Production Phases of Oil and Gas Sector are financed through Norway (Draft Estimate P: 402). The ministry grand total was FY 2014/2015 is 1.775.909.953 UGX and in FY 2015/2016 is 2.723.629.310 UGX (Draft Estimate P: 401). Grand total for FY 2015/2016 is 14.340.221 UGX (Draft Estimate P: 578). Grand total for FY 2015/2016 is 91.107.608 UGX (Draft Estimate P: 690). Energy for Rural Transformation (ERT) II- Rural Electrification for FY 2015/2016 is 10.944.108 UGX (Draft Estimate P: 693). Uganda Women Entrepreneurs Fund (UWEP) funded through the GoU for the FY 2015/2016 is 1.000.000 UGX. Youth Livelihood Programme (YLP) for the budget FY 2015/2016 is set for 33.000.000 UGX (Draft Estimate P: 403). Social Assistance Grant for Empowerment – Sector Institutions and Implementing Partners Supported – SAGE beneficiaries: FY 2015/2016 set to 6.800.746 UGX. Youth Livelihood Programme (YLP) we’re set budget for FY 2015/2016 is 33.000.000 UGX (Draft Estimate P: 418). Sector Institutions and Implementing Partners Supported – o/w transfers to LGs and KCCA for youth projects FY 2015/2016 is set 27.915.180 UGX (Draft Estimate P: 417). Grand total for the Ministry was for FY 2014/2015 we’re 62.792.359 UGX and in FY 2015/2016 is now 70.398.881 UGX (Draft Estimate P: 420). Grand total for FY 2015/2016 is 4.450.000 UGX (Draft Estimate P: 701). Grand total for FY 2015/2016 is 11.700.407 UGX (Draft Estimate P: 559). Grand total for FY 2015/2016 is 5.429.296 UGX (Draft Estimate P: 590). Grand total for the ministry is the 340.742.483 UGX in FY 2014/2015 and in FY 2015/2016 is set to be totally 436.164.599 UGX. Support to National Forestry Authority – Agricultural Supplies in the FY 2015/2016 is 1.919.085 UGX (Draft Estimate P: 912). Grand total for FY 2015/2016 is 23.264.295 UGX (Draft Estimate P: 908). Grand total to the ministry in FY 2015/2016 is set to be 11.215.240 UGX (Draft Estimate P: 496). (Draft Estimate P: 711). Grand total for NITA for FY 2015/2016 is set for 39.200.998 UGX (Draft Estimate P: 714). Establishment of Regional Satelite Wildlife Conservation in FY 2015/2016 is set 5.040.000 UGX (Draft Estimate P: 506). Mt. Rwenzori Tourism Infrastructure Development Project (MRTIDP) in FY 2015/2016 is set to 864.027 UGX. Development of Museums and Heritage Sites for Cultural Promotion in FY 2015/2016 is set to 686.000 UGX. Establishment of Lake Victoria Tourism Circuit in FY 2015/2016 is set 300.000 UGX (Draft Estimate P: 513). Development of Source of the Nile in FY 2015/2016 is set to 680.000 UGX (Draft Estimate P: 514). Grand total to the ministry for FY 2015/2016 is 17.837.396 UGX (Draft Estimate P: 517). Grand total FY 2015/2016 is 11.403.457 UGX (Draft Estimate P: 629). Advertising and PR from FY 2014/2015 was 1.287.601 UGX to FY 2015/2016 is 4.188.280 UGX (Draft Estimate P: 630). Grand total to FY 2015/2016 in 92.979.388 UGX (Draft Estimate P: 525). Printing, Stationery, Photocopying and Binding in FY 2015/2016 is set to 105.686.649 UGX. Capital Purchases in Machinery and Equipment in FY 2015/2016 is set to 30.000.000 UGX (Draft Estimate P: 528). Management of Election in FY 2015/2016 is set 234.967.009 UGX and in FY 2014/2015 is set 141.688.692 UGX (Draft Estimate P: 530). Grand total to the Electoral Commission for the FY 2015/2016 is set to be 265.580.684 UGX and in FY 2014/2015 it was 150.580.684 UGX (Draft Estimate P: 531). Grand total budget to FY 2015/2016 is set to 37.720.116 UGX (Draft Estimate P: 538). In the FY 2015/2016 the MPS are budgeted 201.164.917 UGX (Draft Estimate P: 540). Contribution to other Organizations – Gov’t Contribution to EALA- Arusha set for FY 2015/2016 is set 7.257.179 UGX (Draft Estimate P: 542). Administration and Transport Logistics set for 2015/2016 is set 2.905.774 (Draft Estimate P: 551). Grand total to the Parliamentary Commission for the FY 2015/2016 is 301.697.537 UGX (Draft Estimate P: 552). Grand total for the FY 2015/2016 is 8.920.536 UGX (Draft Estimate P: 553). The biggest expense from last FY 2014/2015 was 290.405 UGX and in FY 2015/2016 is 1.191.699 UGX (Draft Estimate P: 553-554). Grand total for FY 2015/2016 is 14.613.907 UGX (Draft Estimate P: 567). Grand total for FY 2015/2016 is 10.110.804 UGX (Draft Estimate P: 572). Grand total for FY 2015/2016 is 13.715.034 UGX (Draft Estimate P: 638). Up from last FY 2015/2016 on the ‘Rent – (Produced Assets) to private entities’ is 1.702.400 UGX (Draft Estimate P: 639). Grand total for FY 2015/2016 is 139.589.276 UGX (Draft Estimate P: 643). The biggest post was Capital Punishment – Machinery and equipment which is 76.396.918 UGX in this FY (Draft Estimate P: 644). 2ND Kampala Institutional and Infrastructure Development Project FY 2015/2016 is 82.151.560 UGX (Draft Estimate P: 661). Urban Road Network Development total for the FY 2015/2016 is 139.204.569 UGX (Draft Estimate P: 661). Education and Social Service for FY 2015/2016 is 36.155.136 UGX (Draft Estimate P: 666). Community Health Management for FY 2015/2016 is 9.718.674 UGX (Draft Estimate P: 674). Sanitation and Environmental Services for FY 2015/206 is 13.578.579 UXG (Draft Estimate P: 675). Gender, Community and Economic Development for FY 2015/2016 is 2.368.822 UGX (Draft Estimate P: 678). Economic Policy Monitoring,Evaluation & Inspection for FY 2015/2016 is 104.749.162 UGX (Draft Estimate P: 681). Grand total for 2015/2016 is 69.869.913 UGX (Draft Estimate P: 722). One major reason why the budget was different between years is that 250.000.000 UGX was given to ‘Contribution to Autonomous Institutions’ (CAI) (Draft Estimate P: 728). Grand total between the FY was in 2014/2015 was 1.222.034.703 UGX and in 2015/2016 is 2.088.896.738 UGX. Which is total difference: 866.862.035 UGX, parts of this the CAI (Draft Estimate P: 731). Programme 05 Directorate of Value for Money and Specialised Audits for FY 2015/2016 is 4.507.922 UGX (Draft Estimate P: 736). Grand total for the Auditor General for FY 2015/2016 is 46.818.861 UGX (Draft Estimate P: 737). Grand total for FY 2015/2016 is 27.934.069 UGX (Draft Estimate P: 748). Grand total for FY 2015/2016 is 22.763.029 UGX (Draft Estimate P: 784). Grand total for FY 2015/2016 is 238.534.130 UGX (Draft Estimate P: 788). Grand total for UBOS in FY 2015/2016 is 65.543.461 UGX (Draft Estimate P: 827). Grand total for FY 2015/2016 is 4.997.601 UGX (Draft Estimate P: 849). Grand total for FY 2015/2016 is 3.209.142 UGX (Draft Estimate P: 859). Government Purchases for FY 2015/2016 is 177.704.389 UGX. Grand total for FY 2015/2016 is 183.974.681 UGX (Draft Estimate P: 881). Grand total for FY 2015/2016 is 10.722.548 UGX (Draft Estimate P: 887). Grand total for FY 2015/2016 is 20.728.194 UGX (Draft Estimate P: 892). What if the Public Order Management Act (POMA) was aimed at the National Resistance Movement? Bobi Wine is now under House Arrest! Bobi Wine arrested on the way to hold a Presser at One Love Beach, Busabala! Sudan: The Joint Forces of the Declaration of Freedom and Change have suspended the negotiations with the Transitional Military Council! Bobi Wine’s Kyarenga Extra Easter Monday Concert: Blocked!